Everyone knows the Greenleaf family puts the “Hell” in Hellcat Canyon—legend has it the only way they ever leave is in a cop car or a casket. But Glory Greenleaf has a different getaway vehicle in mind: her guitar. She has a Texas-sized talent and the ambition (and attitude) to match, but only two people have ever believed in her: her brother, who’s in jail, and his best friend . . . who put him there. Sheriff Eli Barlow has secretly been in love with Glory since he was twelve years old. Which is how he knows her head is as hard as her heart is soft—and why she can’t forgive him for fracturing her family . . . or forget that night they surrendered to an explosive, long-simmering passion. But when a betrayal threatens Glory’s big break, Eli will risk everything to make it right . 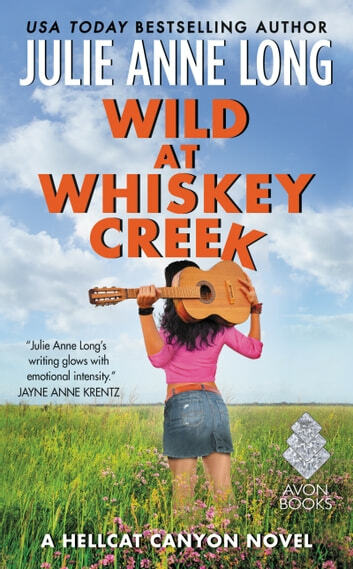 . . because the best way to love the girl from Whiskey Creek might mean setting her free forever. Long rocks the 21st century! Any doubts I had about Julie Anne Long' s contemporary romance series have been erased by Wild at Wbiskey Creek. It is as beautifully written as all of her earlier novels, and the protagonists just grab hold of my heart and won't let go. Amazing, wonderful characters in a terrific tale about the power of love and tbe importance of dreams. Thank you for the magic, JAL!